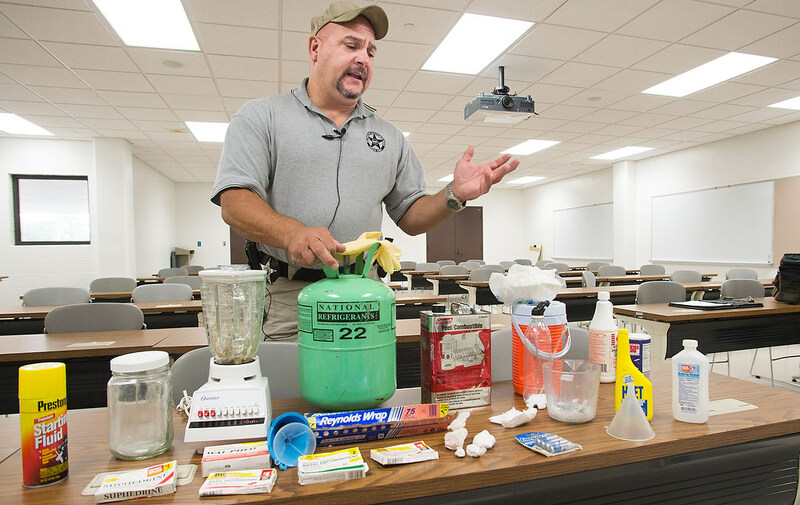 Illinois' Vermilion County Sheriff's deputy Patrick Alblinger talks about the area's meth problem and shows examples of lab components on Monday, Sept. 30, 2013. Illinois’ Vermilion County Sheriff’s deputy Patrick Alblinger talks about the area’s meth problem and shows examples of lab components on Monday, Sept. 30, 2013. In Vermilion County, Illinois State Police seized 77 meth labs in 2012, the second most seizures in the state. Once thought to be on a downward spiral, these cases indicate meth use is climbing again. In fact, Illinois registered the fifth-most meth lab seizures and arrests in the country last year, behind Missouri, Tennessee, Indiana and Kentucky. And the number of meth labs in central Illinois is on the rise, though national meth incident numbers are down by 16 percent from 2011, according to the Drug Enforcement Administration. After Illinois signed the Methamphetamine Precursor Control Act into law on Nov. 16, 2005, lab seizures initially decreased and hit a low of 390 lab seizures in 2008. Since then, the numbers have continued to rise, and meth lab seizures have returned to previous levels. In 2006, state police seized 786 labs. In 2012, state police seized 785 labs. Agents from the Illinois State Police’s Zone 5 Meth Response Team in east central Illinois said last year’s total had already been surpassed by the end of July. Some meth operations are large. Tena Logan’s involved a three-year period with dozens of people making hundreds of purchases of pseudoephedrine, a key ingredient in the making of meth, according to court records. There was no evidence she ever purchased pseudoephedrine during that time. Other operations, such as Pasley’s, are small. He was charged with possessing and manufacturing more than 900 grams of meth before pleading guilty to having and making less than 15 grams. In his mid-20s, he learned to make his own meth in order to get it cheaper. Pasley said he would make enough meth to satisfy his cravings and then sell the rest to buy supplies for his next batch. His preferred method was to use anhydrous ammonia, which required more pseudoephedrine than the so-called “shake-and-bake” method. Because of his preference, he had to experiment with other recipes at times. Law enforcement officials said Pasley’s operation was typical of meth users, who run their own smaller, personal operations focused on cooking a day’s worth of meth. Ingredients for making meth include regular household items such as aluminum foil, starter fluid or even lithium batteries. Users can make the drug with something as small as a single two-liter bottle or a pot, techniques known as the shake-and-bake and the one-pot methods. Manufacturers go largely unnoticed with these methods because they remain mobile and do not require multiple people. They can fit their supplies in the average backpack. “We’re seeing a lot more of those than we are the bigger labs,” said Troy Phillips, director of Vermilion County’s Metropolitan Enforcement Group, Vermilion County’s drug task force. That means a lab seizure can be as little as finding a bottle, some pills and other cooking supplies — sufficient chemicals and equipment to manufacture meth. Or, it can be as big as finding 500 bottles used for meth manufacturing, which happened in Adams County in January. But whether big or small, labs are only counted once in state police statistics, making it difficult to know the actual amount of meth in the state. While some labs are seized by police, many meth operations in Illinois go unnoticed for long periods of time, said Ralph Weisheit, a meth expert and criminal justice professor at Illinois State University. Unless a rural operation brings attention to itself, there is little chance that law enforcement officials will find it. In rural areas, it is common for a meth producer to make a low-quality batch of meth that will last a day before ditching the equipment, the leftover chemicals and the evidence of ever manufacturing the drug, Weisheit said. In 2010, Illinois joined the National Precursor Log Exchange in an attempt to curb meth use by requiring pharmacies to maintain electronic databases on who purchased pseudoephedrine, how much they purchased and when they purchased it. Besides Illinois, 26 other states are also part of the Log Exchange program. It was difficult for Pasley to find meth prior to his arrest, he said, because pseudoephedrine pills were scarce following these new laws. When the state first began cracking down on pseudoephedrine purchases, pharmacies only had to keep track of the purchases via pen and paper. Law enforcement officers had to go to each pharmacy to check their individual logs in a “tedious” process, said Don Payton, statewide clandestine laboratory coordinator for the Illinois State Police. But with the 2010 pseudoephedrine restrictions, meth manufacturers have adapted and found ways to work around the limitations. The names of everyone who purchases pseudoephedrine goes into the database, even if they don’t exceed the legal limit. If somebody tries to purchase more than the legal limit, the database alerts the pharmacy to reject the sale. Does database help or hinder? Law enforcement officials debate whether the pseudoephedrine database does more harm than good when it comes to catching meth producers. On one hand, the database prohibits the sale of pseudoephedrine if somebody has already purchased the legal limit of 7.5 grams in a 30-day period. This prevents a vital ingredient for making meth from getting into the hands of a potential manufacturer in bulk quantities. On the other hand, that restriction does not allow producers to buy excessive amounts of pseudoephedrine, which gives agents clear suspects to pursue in their attempt to eradicate meth. Agents are still able to see those who were denied sales, however, so it can still be effective, said Chris McGuire, special agent and Chicago’s divisional clandestine laboratory coordinator for the Drug Enforcement Administration. The only real difference is that you no longer get the “super idiots” who used to buy excessive amounts of pseudoephedrine, he said. Payton of the state police said it was common to see 2,000 or 3,000 pills in a single lab prior to the pseudoephedrine restrictions. Now many manufacturers only use about 100 pills per cook. One method that meth producers use to cook their drug is called the “shake and bake” method, which involves using cheap plastic bottles. The pseudoephedrine tracking system helped locate 292 of Illinois’ 785 labs seized in 2012, Payton said. There were also 687 meth-related arrests, 397 of which were attributed to using the database. Meth-related arrests include people who are involved with meth production, possession or distribution in any way. In 2011, of the 576 labs seizures, 283 of them were attributed to use of the database. There were 548 meth-related arrests, with 401 following use of the database. As lab seizures increase, so too do the number of labs seized as a result of using the pseudoephedrine database, which Payton said is a sign of its effectiveness. One reason for the increased lab numbers is the decreased production per cook. With smaller-sized cooks, there is a need to cook more often. Payton said a common pattern is for addicts to cook enough meth on Thursday to last through the weekend, and then again on Monday to last through the week. The agents at the Illinois State Police’s Zone 5 Meth Response Team were present for the lab cleanup at Tena and Paul Logan’s residence. After seeing hundreds of meth labs, master sergeant Mike Atkinson has come up with another term for them. “They should be called ‘meth dirty kitchens,'” he said, because science and cleanliness are uncommon for meth operations. 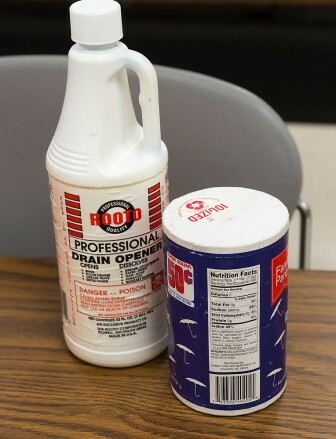 The cleanup team primarily encounters the shake-and-bake method that uses plastic bottles and a variety of household supplies, such as Coleman fuel, batteries, salt and coffee filters. Atkinson’s team is responsible for the cleanup of every meth lab in east central Illinois. But cleaning a lab does not necessarily mean making the facility, residence or car safe for people to enter. The agents only collect evidence and remove the materials and chemicals. The rest of the mess and contamination are left to private contractors at the owner’s expense, should the owner choose to hire them. Illinois does not have any requirements for landlords or homeowners to clean up after a meth lab. There is a typical profile for users of “white person’s crack,” said Marc Richards, special agent at the Meth Response Team. Some addicts will recruit African Americans for their smurfing operations because they aren’t the “skanky whites” police officers typically deal with when rooting out meth, he said. Meth users drive these recruits to buy pseudoephedrine in exchange for money or other illegal drugs. 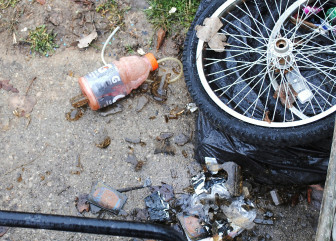 Ingredients used for cooking methamphetamines litter the ground. Such parts are often found with small cooking operations, making it difficult for police to track. Even for many lifelong drug abusers, meth is something they never want to be associated with. 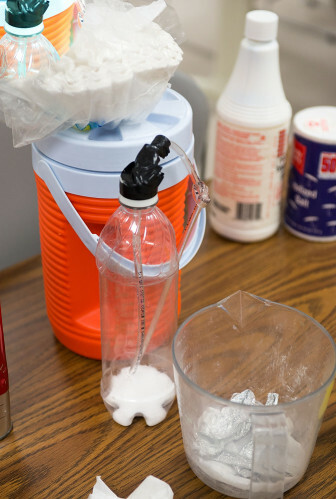 Brandon Underwood, addiction counselor at The Prairie Center’s outpatient facility in Urbana, Ill., said he has heard the worst addicts of other drugs describe meth as “the lowest of the low,” and swear they would never touch it. Less than five percent of the addicts he helps are addicted to meth, he said. Even Vermilion County does not see many meth addicts, said Susan Perkins, director of The Prairie Center’s office in Danville, Ill., despite the county having the second most lab seizures in 2012. The number of meth addicts they see has been declining over the past few years, she said, while the number of lab seizures is increasing. “There is very little violence connected with meth in central and southern Illinois,” Weisheit said. This means there are fewer reasons for police officers to notice meth manufacturing. There is not much money owed between people for small operations, so business typically goes off without a hitch. More often, personal conflicts or domestic issues bring police attention, and then the meth is found. Weisheit believes this may change, because downstate Illinois is still an untapped market for the Mexican cartels. The cartels focus on wholesale distribution to cities, but their high quality meth and organized operations are prime for taking over any drug market — especially ones made up primarily of addicts who have to make their own drugs. The cartels are already using many interstates such as Interstate 80, I-55 and I-57 for transporting large shipments between major cities, McGuire said. The Drug Enforcement Administration believes the majority of all drugs in the U.S. are a result of the cartels. As Mexican cartels expand their business into downstate Illinois, they are likely to also bring more crime, Weisheit said. Currently, mostly friends and family members are involved with larger operations in the state, so little money has to trade hands. More sellers and less personal history could mean more money to claim and more turf to defend, Weisheit said. And if this does come true, the meth that winds up in the hands of addicts could still be equally as poor as it currently is, Haas said. Mid-level drug dealers will always cut their product with additives in order to multiply their supply. “Many people step on it before it hits the streets,” he said. There is a historical trend that shows future generations tend to underestimate the danger of the drugs of past generations, Weisheit said. Stimulants and narcotics trade places as the main drug of choice. But as for which drug in particular will arise next, it’s never easy to say.